Bates Freedom is proudly manufactured in Big Rapids, Michigan. 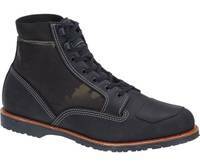 It is Berry Compliant and the perfect boot for riding or casual wear. The 5 stars represent the 5 branches of our military, along with red stitching as a reminder of the sacrifice made by our military. The flag on the right boot matches the flags worn on uniforms to symbolize going into battle.